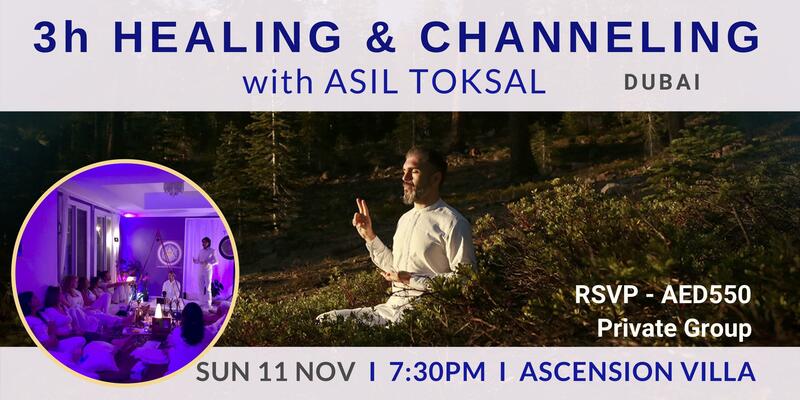 Welcome to 3hours Channeling & Healing with Asil Toksal at @ascension platforms. This event is created for the committed souls that desires a more private healing experience. 22 spots only. Payment in advance to secure your space. All details, please read further. This is an invitation to an unique experience of deep healing and channeled wisdom. If this resonates with you, please join with your open heart and mind (this is not a meditation). It is a 3-4 hour immersion into high-frequency presence. During these sessions, Asil Toksal opens up to channel high-vibrational energy and entities, such as Angel Emmanuel, Archangels Raphael, Michael or Zadkiel. You may experience deep peace within, connections to other realms, healing, transmission and/or downloads of energy, psychic surgery may also happen if relevant. You will also have the opportunity to ask direct questions to the guides. We are calling for your readiness and excitement to co-create this high session in an unified elevated field of harmony and Love. Please read carefully the information below for your self-preparation & Booking. – Please arrive on time or before time. We start at 7:45pm. Make sure your schedule is free up till 11:30pm. Thank you for taking the time to read this email, and for choosing to dedicate yourself to this process of awakening and grounding your spiritual light into your beautiful physical body. We look forward to sharing this space and this deep work with you. We are honoured to go on this journey within. We serve as a bridge to higher dimensions to provide the self-mastery guidance, wisdom and teaching required to embody your divine potential. We are looking forward to welcoming and co-creating with your energy. With Gratitude, Love, Light and high Golden Diamond Light to your Heart.